A black Melbourne, Fla., church was vandalized, its property damaged and a truck belonging to the bishop found submerged in a pond with "SS. 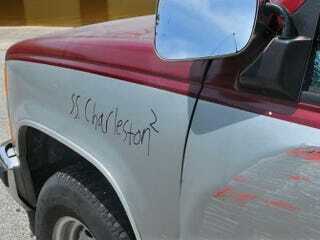 Charleston 2" scrawled on the side, My News 13 reports. Police have officially classified the attack as a hate crime, Police Cmdr. Dan Lynch told Florida Today. According to My News 13, the New Shiloh Christian Center bistro was also targeted, with glass shattered and fire extinguishers sprayed all over the building. "They came back into the foyer area, and the flower that was sitting up was down on the floor," Bishop Jacquelyn Gordon told the news station. "A portrait of myself and my husband, they took out of the main foyer and left it on the floor." But to Gordon, what was most terrifying was finding her husband's vehicle spray-painted with the "Charleston 2" phrase and submerged in a pond with the doors open and glass everywhere. This is the third time that the church has been targeted, according to Gordon. Earlier, a storage room at the church was set on fire. Vandals also spray-painted swastikas on a storage unit shed, the news site reports, causing about $5,000 in damages in total for the two attacks. The police were hesitant to label the attacks hate crimes until Monday, a source of Gordon’s frustration. "Each time we are told it is not a hate crime, and we are not being targeted, but why is it that it has happened to us three times?" Gordon said. "There are other churches in this area. We are not the only ones." Gordon has had security at the church when people are present, but now is planning to secure the property 24-7 in light of the latest attack. Read more at My News 13 and Florida Today.